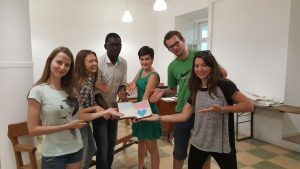 From 21st to 28th August, 18 young people from all around Europe and from different religious and educational backgrounds gathered for the training course “People in Poverty: Part of a Bigger Picture?” which took place in Lisbon, Portugal. It was organized by EYCE with help of 6 volunteers and supported by the Council of Europe, Brot für die Welt and Otto per Mille. The main objectives of this week were to explore different methods of advocacy and empowering young people with the knowledge and skills necessary to advocate for the rights for people in poverty to be part of the society as well as to understand how poverty changes one’s identity. At the beginning of the week, participants got an insight into the situation of poverty in Europe and the statistics behind it. Participants also had a chance to explore what is poverty both from personal and international point of view. Through different presentations, role games and other non-formal methods of education, participants learned first-hand how it can feel to be poor as well as how others might feel. As personal identity was one of the biggest aspects of the event, participants received a great speech from one of the speakers, Alfredo Abreu (Chairman of Serve the City in Lisbon) who lead first two session of the second day of the training course, enabled deeper insight into personal identity as Mr. Abreu works on different projects engaging different sorts of people in Lisbon throughout the society and the stories he shared with participants were truly touching. He explained different relationships between people, money and power on which society works as well as mentioned various mechanisms one can observed. Furthermore, he gave the group a tour around city centre of Lisbon where participants got the chance to meet various people Serve the City is working with. These sessions contributed to deeper understanding how poverty affects identity and provided with a great source of motivation for participants for the rest of the week. On second day of the training course, in the afternoon, participants visited NPISA centre which is bringing together organisations working with homeless people, sharing their best practices as well as helping with different aspects of needs of homeless. Participants had a chance to see how the centre is working during the week days followed by a reception at the City of Lisbon Council, with João Afonso, Head of Social Rights Department. Participants got the chance to discuss current issues City of Lisbon is facing as well as the ways how they combat poverty and homelessness. Third day of the training course was dedicated to a day-long advocacy training led by Ana Blanco, trainer from Spain. During this advocacy training participants learned methods of advocacy as well as were equipped with tools to learn and work practically as advocates in their own respective contexts. Emphasis was put on empowering participants to use these skills as later during the week, they had a chance to test their own advocacy strategies in the streets. On the fourth day, advocacy theme was also discovered from theological perspective as participants explored the Christian attitude towards poverty and discussed different perspectives of Bible on advocacy. Second part of the training course was dedicated to practical workshops, creating advocacy strategies as well as testing them in the field. As for the practical workshops, participants had the possibility to choose from Fundraising, Negotiation techniques and Counselling workshops. This gave space to participants to practically use gained knowledge, skills and tools to create projects. They also had a chance to try one of the EYCE’s Campaign “Break the Chains!” concept, Sharewich day. This meant that the participants shared their sandwiches with people in need, who live on the streets. Beside this activity they had to perform the practical part of advocacy strategies that they created the previous day. Participants were divided into three groups of 6 people. The first group prepared its strategy to point out the problem of empty houses. Lisbon is the city with the highest number of empty/abandoned buildings in Europe. There are 4000 empty houses beside 1500 homeless people. This means that every homeless person could have a roof over their head. 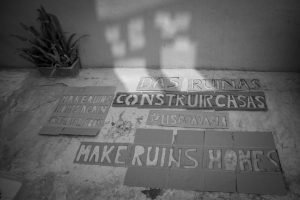 The group made a quote “Make ruins homes again” and a hashtag “#emptylisbon”. They sprayed them on few empty buildings and are shared the message on the social media. To continue, the second group compiled a book of cheerful messages for people in need. The messages were written by the participants and people that they asked on the street. The book as later on given to Alfredo Abreu, guest speaker present at the training course and he handed it forward. The second part of this action was that the group members spread cheerful messages also in the city, by giving them for the homeless people on the street. They also shared sandwiches and candies with them. Finally, the third group went to the streets and photographed the homes of the homeless. Later they printed out the photos and compiled an exhibition, and linked the individual photos to a Lisbon tourist map. The aim of the project was to raise awareness of the problem of homelessness in Lisbon. This exhibition was installed in the City of Lisbon Council. EYCE would like to warmly thank everyone in the Lisbon, Portugal that was involved with the preparation and realization of this training course, especially Míriam Lopes that helped us with many practicalities and contacts in the city, Evangelical Church of Lisbon and its Pastor Luís de Matos and Gabriela Almeida from UPPSS for their hospitality and Alfredo Abreu, Ana Blanco, João Perreira, João Marrana and João Afonso for spending their time with the group.